Noel Mariano (comment #13), who writes that he is currently in the midst of reading Barbara Jane Reyes’s Diwata and re-reading Bino Realuyo’s The Gods We Worship Live Next Door. 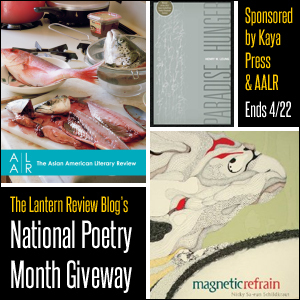 Noel will receive a 1-year subscription to the Asian American Literary Review (courtesy of AALR), a copy of Nicky Sa-eun Schildkraut’s Magnetic Refrain (courtesy of Kaya Press), and a copy of Henry W. Leung’s Paradise Hunger (courtesy of the author). Congratulations, Noel! We hope you’ll enjoy your prize! Rumit Pancholi, who’s reading Li-Young Lee and Garrett Hongo. Cathy Linh Che, who adores Srikanth Reddy’s Facts for Visitors. R., who has Myung Mi Kim and Barbara Jane Reyes on the top of their list. Roberto Ascalon, who’s reading Jon Pineda and looking forward to Jason Bayani’s Amulet. Michelle Penaloza, who recommends both Eugene Gloria and Luisa Igloria. Luisa Igloria, who wrote of her love for Paisley Rekdal’s work. Michelle Lin, who’s enjoying Kimiko Hahn’s The Narrow Road to the Interior at the moment. Jane Wong, who recently finished (and loved) Lynn Xu’s Debts and Lessons and also recommends the work of Cathy Park Hong (having recently read Engine Empire) and Myung Mi Kim. Kristen Eliason, who says she visits and revisits For the Fighting Spirit of the Walnut by Takashi Hiraide, Mad Science in Imperial City by Shanxing Wang, and Incubation: A Space for Monsters by Bhanu Kapil. We were thrilled to see everyone’s responses. 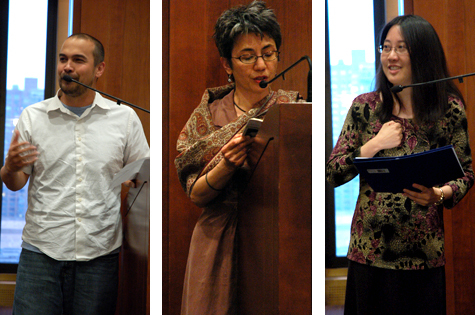 There was a wide range of names mentioned in the thirty-four comments that were left on the original post; Ching-In Chen, Kimiko Hahn, and Li-Young Lee topped the list at 4, 3, and 3 mentions each, while a number of other poets (Jason Bayani, Tarfia Faizullah, Bhanu Kapil, Myung Mi Kim, Karen Llagas, Barbara Jane Reyes, Ocean Vuong, Lynn Xu, and Andre Yang) were mentioned twice. Other writers who showed up on people’s lists included: Arthur Sze, Karen An-Hwei Lee, Dilruba Ahmed, Angie Chuang, Cynthia Dewi Oka, Leah Lakshmi Piepzna-Samarasinha, Kenji Liu, David Maduli, Pos L. Moua, Soul Choj Vang, Ka Vang, Sesshu Foster, Angela Torres, Matthew Olzmann, Koon Woon, Allen Qing Yuan, Beau Sia, Amy Uyematsu, Russell Leong, Mitsuye Yamada, Joel Tan, Tsering Wangmo, Lee Herrick, Hiroshi Kashiwagi, David S. Cho, Bao Phi, Ed Bok Lee, Lois-Ann Yamanaka, Sasha Pimental Chacon, Burlee Vang, Ishle Yi Park, Sally Wen Mao, Lo Kwa Mei-En, and Hoa Nguyen. (To read about these recommendations in more detail, click here to see the original post). Many commentors also took the time to leave detailed remarks about the work of the poets they’d mentioned. Their recommendations have definitely nudged us to add several names and titles to our reading lists, and we hope they’ve inspired you, too! Congratulations to all our winners, and thank you so much again to everyone who entered, as well as to our generous sponsors, AALR, Kaya, and Henry Leung. 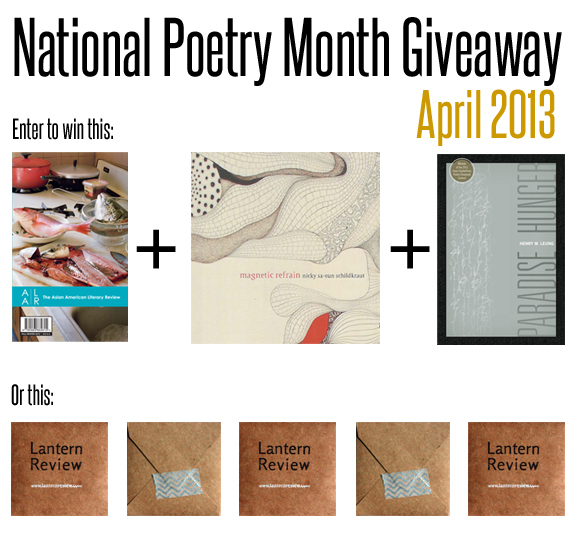 A very happy tail end of National Poetry Month to you all! We’ll see you on the flip side, in May, when we’ll continue our celebration of Asian American poetry with more special content for APIA Heritage Month. Today’s installment of Summer Reads 2012 is the last of this year’s series, and a bit of a double-header. We have reads from two of our favorite LR Blog staff writers, Jai Arun Ravine and Henry W. Leung. Rachelle Cruz, Self-Portrait as Rumour and Blood (Dancing Girl Press), because it is about the aswang, a Philippine witch/vampire, and it has a bat/pterodactyl on the cover. Javier O. Huerta, American Copia: An Immigrant Epic (Arte Publico Press), because it is about going to the grocery store and being checked out–by cashiers, cuties and INS agents. Sarith Peou, Corpse Watching (Tinfish Press), because it is about being incarcerated and surviving the Khmer Rouge genocide, and for the amazing way it is bound. I’ve been in Prague discovering the work of incredible Czech writers. I got to hear Ema Katrovasread her prodigious translations of Šrut’s poems, which are brief and profound pieces following an everyman figure named Novak; and I got to hear Klima read a very insightful essay from his collection, about consumerism’s impact on religion and spiritualism today. Lustig, I’ve been told, was dedicated to the teaching of writing through fables; he was a Holocaust survivor (one of his titles, Transport From Paradise, is a heartbreaking reference to the way that the concentration camp at Terezín was paradise compared to the others), and an enormously important writer during the Velvet Revolution (along with Klima, Kundera, et al); he just passed away last year. To see the rest of this series (and find out what else our contributors have been reading this summer), click here. What have you been reading this summer? Leave us a comment or drop us a line on Facebook or Twitter to let us know. 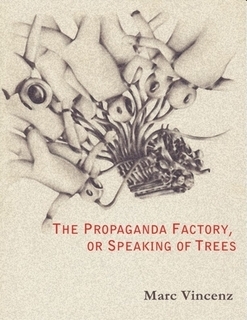 Contributor Marc Vincenz’s new e-book The Propaganda Factory was released by Argotist EBooks this past August. In this short collection (which includes “Taishan Mountain,” a poem that first appeared in LR issue 2), Marc weaves together layers of history and geography through an ever-shifting range of lenses that take us from the level of the microscopic to the realm of the galactic at a moment’s notice. It is available for download here. 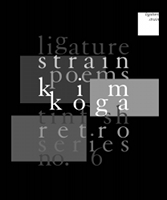 Issue 3 contributor Kim Koga now has a chapbook (ligature strain) out with TinFish. In this linked sequence, which was published as #6 in TinFish’s current retro chap series, Kim floods the page and the mind’s eye with feverish, liquidly intense imagery that involves birth, echolocation, pink and white flesh, and lots of fetal beavers (yes, the actual animal). Be on the lookout for more about ligature strain later this month. LR News: Introducing Our 2011-2012 Staff Writers! Interviewer Wendy Chin-Tanner, who is new to our team this year, will be chronicling her conversations with different Asian American poets from month to month. Returning Staff Writer Henry W. Leung will be transitioning out of his previous role as a reviewer, and into a new position as a Columnist. His new column, “Panax Ginseng,” will explore themes of transnationalism, multi-lingual blending, and hybridity in texts of both poetry and prose. Returning Staff Writer and Columnist Kelsay Myers will continue to reflect on her experiences in the M.F.A. program at Saint Mary’s College of California through her column “Becoming Realer,” and will also occasionally contribute other content (such as interviews). Reviewer Jai Arun Ravine, who is also new to our team this year, will be writing about different, recently-published books, chapbooks, and/or issues of literary journals each month. We feel privileged to be able to welcome (or, in the case of our returning writers, welcome back) such a strong, cohesive team. We have an exciting lineup of posts planned for this fall, and are confident that you will enjoy the content that Wendy, Henry, Kelsay, and Jai will be contributing to the blog. To read more about each individual Staff Writer, please see their bios on the updated Blog Masthead. You’ll see the first of our staff-written posts for the year (an interview conducted by Wendy Chin-Tanner) appear later this week. Cheers to the new year, and a warm welcome (once again) to our new team. Welcome to our Summer Reads 2011 blog series! Throughout the months of July and August, we will be featuring recommended reading lists submitted by Lantern Review contributors who want to share either books they plan to read themselves this summer, or titles they want to suggest to the wider LR community. This week features a set of reads from Issue 1 contributor and 2010-2011 staff writer Henry W. Leung. Foreign Accents by Steven G. Yao. This just came out and was a helpful if limited summation of the three broad phases of Chinese American verse (racial protest, lyric testimony, & ethnic abstraction). Chinese Writers on Writing edited by Arthur Sze. Also just came out. All translated from Chinese, some for the first time. I recommend the whole series: it’s a hugely important intro to current international writers–on their own terms. After Confession edited by Kate Sontag & David Graham. Ten years old but a grand discovery for me. American poets on where the “I” belongs in poems today. The History of Anonymity by Jennifer Chang, my patron poet from Kundiman! Duncan the Wonder Dog by Adam Hines. I’ve just started this and it’s gorgeous, multitextual, and resonates with some of what DeLillo did in White Noise. Thanks for this reading list, Henry, and happy summer! Henry’s poem “Question for a Painter” can be found in Lantern Review, Issue 1. His many editorials, interviews, and book reviews can also be found on the LR blog – just search for his name on the blog’s homepage. For our Summer Reads series, we’ve asked contributors from Issue 1 to share what they’ve been reading or plan to read this summer. This week’s installment features reads from Craig Santos Perez and Henry W. Leung. Many thanks to Craig and Henry, for sharing their reading lists with us. You can check out Henry’s poem “Question for a Painter” and Craig’s review of Skirt Full of Black in Issue 1 of Lantern Review.